It has been my experience that when a park map has "Osprey Trail" marked on it, it means there might be a view of a man-made platform on top of a pole, on which may or may not be an osprey nest, with perhaps another platform visible way off in the distance. With that mindset I had no great expectations as I hiked down the Osprey Trail at Honeymoon Island State Park in Dunedin, Florida near Tampa. An hour later I was trying to decide how high to place Honeymoon Island on my Top 12 Favorite Places. I expanded the list to 13 places and slotted Honeymoon Island at #5. 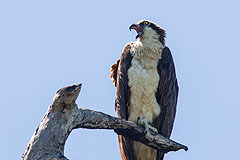 There aren't a couple of nesting osprey in the park, there are dozens. The nests are not on artificial platforms, they are built in trees. And best of all, the birds are not the least bit skittish when an earthbound human with a camera walks by. I did two loops around the trail one afternoon, and any future trips to Florida will have to include a swing by Honeymoon Island. I flew into Orlando Thursday evening, and my first excursion on Friday was a return visit to a place already on my favorite places list, the St. Augustine Alligator Farm. Birds feel safe nesting above the alligator pools because the gators keep away egg stealers such as raccoons. When I was there in late March a few years ago, the eggs hadn't started to hatch yet. 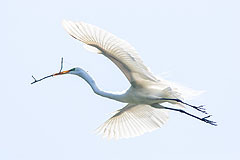 This time, there were a number of young egrets squawking for food. There also were a lot more nesting wood storks this time. Saturday I stopped in at the Merritt Island National Wildlife Refuge adjoining the Kennedy Space Center. It seemed very dry and there weren't many wading birds along the wildlife drive. Based on what I saw a few years ago, December is probably a better time to visit. I hiked the short trail behind the visitor center and saw a screech owl poking its head out of a nest box. It was the first time I've seen an owl in the wild. Further down the boardwalk a fellow from Maine pointed out a vireo nest swinging from a very thin branch. The beak and eye of the nesting bird could be seen poking out the top. That afternoon I headed to Tampa for the remainder of my brief vacation. Sunday I headed down I-75 to Venice in search of an Audubon rookery. The directions I had hadn't been updated since Florida changed its Interstate exit numbers several years ago, so I got off at the wrong exit and ended up lost in downtown Venice. I saw a real estate office with an "Agent on Duty" sign, so stopped in and asked for a city map. The Realtor was very helpful even though it was obvious I wasn't there to buy a house, so I'll put in a plug for his company: For all your real estate needs in the Venice area, see the friendly folks at Michael Saunders & Company. The rookery turned out to be a small island in the middle of a small pond. I should mention that during each day of this trip my photo shooting didn't begin before 10:30, and I was on my way back to the hotel long before sunset. Arthur Morris would not approve. Morris is a fairly famous bird photographer under contract to Canon, and his photos are used in the Venice Rookery brochure. The best light for nature photography is during the hours just after sunrise and just before sunset, so he wouldn't be hanging around the rookery during the harsh light of noon to cast a disapproving eye. To avoid being turned away from the nature photography corps, I'll call my efforts of the week a scouting trip rather than a nature shoot. Monday was my tour of Honeymoon Island. In addition to the osprey, the other highlight was a great horned owl nest. Two youngsters could be seen poking their heads out, and an adult was lurking nearby in a pine tree. The mature owl was in shade and I didn't get a great shot, but through binoculars the thing looked like a huge fuzzy barrel sitting on a branch. The park guy said the owl stole the nest from some osprey this year, so they had to build a new nest a few trees over. Also on the trail I saw one bald eagle, several tortoises, and lots of colorful little birds flitting around. A birder would probably have a good time on the island even without the big raptors. Even though my trip to Florida was just a brief scouting trip, I came away with quite a few photos that suggest what I might be able to get when I can show up at the appropriate hour.